- INVITATION: 5x7” or 6x4"
Recommended Adhesive Paper: Full 8.5x11” sheets with no template cuts. Or regular paper and glue/double sided tape. I can only change the text in the Thank You card. The labels cannot be changed. Please check for edits or spelling before you send the information as this will save review time. Please check in the next 24 hours (even your spam - junk folders). ► PHOTO - Send it to: myheroathome@gmail.com or attach it in a conversation to me. ONLY ONE PHOTO per child. The quality of your printed invitation is only as good as the photo you send in. Choose your favorite photo (I’ll let you know if the quality isn’t good). To change it for a new one will be an extra fee of US$ 5.00 each time. Please, understand that working on the photo is the most difficult part or the invitation. ► ONE REVISION is included with your order. Any additional revisions may be subject to extra fees. ►If there is a mistake from my side I will correct it with no extra charge after reviews. ► You will receive your files usually within hours of payment & all needed information is received - except weekends (unless there are internet connectivity issues). ► Due to different printer quality and monitor calibrations, colors may vary slightly. ► Refunds cannot be provided after delivery of digital image due to the nature of the product. ► walgreens.com, cvs.com, vistaprint.com, snapfish.com, Target, Shutterfly, Sam's Club and some Costco and Kinko locations. Sometimes some of these will not print them: Staples, Wal-Mart, Office Depot, Office Max, a few Costco and Kinko’s locations. Please understand and note that you are paying for my creative service and time spent personalizing your item with personal information and working with your photo, which is permitted for one-time PERSONAL USE ONLY. 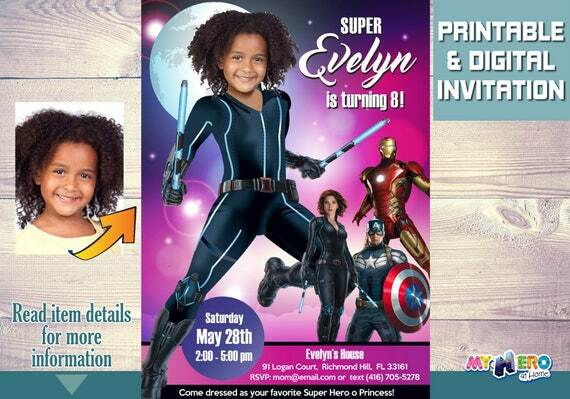 This invitation is NOT a licensed product and all character images used are free and not being sold. We DO NOT SELL or claim ownership over the character clipart or graphics; they belong to their respective copyright holders. Items purchased are for one-time personal use only and are not to be re-sold, copied or shared for any reason.